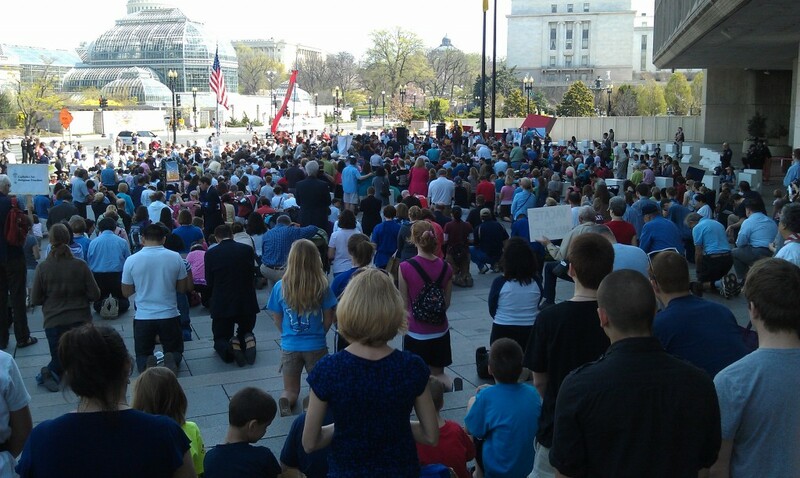 There were rallies for religious liberty in 146 cities across the country yesterday. 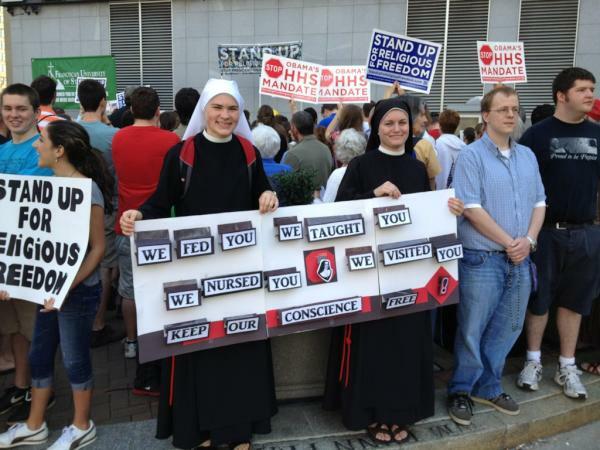 We joined 1300 folks outside the HHS building in DC (and got a sunburn! It was 80F!) to protest the shriveling of the right to free exercise of religion to a mere freedom of worship, such that govt decides what is and isn't a religious institution and which of its own doctrines a religious institution may follow. Thomas Peters has pix from packed crowds in Chicago, New York, Houston and various other places. K-Lo documents the majority of women in the crowd, with bonus pictures from other city's protests. On EWTN's facebook page, find shots viewers sent in from protests all over the country. A slideshow from Lifesite news. by Tom Crowe, from the Pittsburgh rally, shamelessly pinched from Josh Mercer. Update: It's later. Star Parker gave the keynote address at the DC protest. She was excellent, but even better was the address given by Fr. Marcel Guarnizo: a closely-reasoned, eloquent defense against the HHS mandate on constitutional and "Declaration-al" grounds. It was Lincolnian (just about my highest compliment). Surprisingly moving was an address from a Korean pastor who flew from Seoul for the event. At first I thought his inclusion was odd. This is an American political fight, after all. But when he spoke about how America (as the regime of freedom) had to be preserved because it has been Korea's greatest blessing and a blessing to all who love freedom everywhere? Tears! 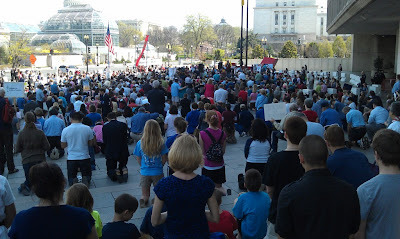 I was surprised how many non-Catholics were present. There's no way to tell by looking, of course, but at the close of the demonstration we prayed the Our Father together, and half the crowd added, "for Thine is the kingdom...." The MC for the event was Patrick Mahoney, a Presbyterian minister, who amused us by saying that though he was Protestant, "Catholics rock!" He claims he took down his Beatles poster and put up one of Cardinal Dolan. That may have been facetious, but it struck me once again that nothing does more for the union of Christians and genuine ecumenism than joint efforts to prevent religious faith from being driven out of the public square.